An Old Napoleonic Bollard in Wapping? A few months ago, The Greenwich Phantom made me aware of the fact that early bollards used on pavements came from cannons captured during the Napoleonic war. The cannons were apparently stuck in the ground with a cannon ball on the top – and the design has remained ever since. If you look at modern bollards, many are indeed not that dissimilar to a cannon with a cannon ball on the top. The problem with this is that metal is a precious commodity, and I found it difficult to believe that such a valuable lump of metal would be so casually dumped as street furniture. I wondered if it was an urban myth based on a somewhat more mundane truth. A bit of research later, and these valuable captured cannons were indeed scrapped by the British government following the Napoleonic Wars – as a result of political lobbying by the arms industry. It seems that the armaments manufacturers were worried that the government would reuse the captured cannons for its own military forces, and hence the firms wouldn’t be able to sell more cannons to the government. After representations to the government, it was agreed that the loss of business would close several companies and as a healthy arms industry was (and still is) considered to be vital to national security, Parliament agreed to scrap the French cannons. In actuality, they ended up being buried muzzle down to act as road bollards. Later they were buried muzzle upwards with the classic cannon ball stuck on top. So, in order to save the British arms industry, hundreds of valuable cannons were unceremoniously taken over by local authorities for street furniture. However, there is a side-effect of this, as street bollards were largely unknown in England at the time, and the use of the captured cannons as “new” bollards would have reminded the populace of the recent military victory in France and probably been something of some pride for the populace. Anyhow, the reason for this ramble, is that I have often noticed a rather old looking bollard in Wapping and the other day I finally remembered to have a decent look at it and take a photo. If not an original Napoleonic cannon, it is at the very least not much later in age. I’d guess that if it is an original, it is probably quite valuable now. The bollard is on the corner of Wapping Rose Garden, in case you want to have a personal visit – or to dig it up and take it along to the Antiques Roadshow being held in Greenwich later this year. Incidentally, the word bollard is thought to come from the French “bole”, which referred to a short stout stump of wood used for tying boats alongside piers and jetties. 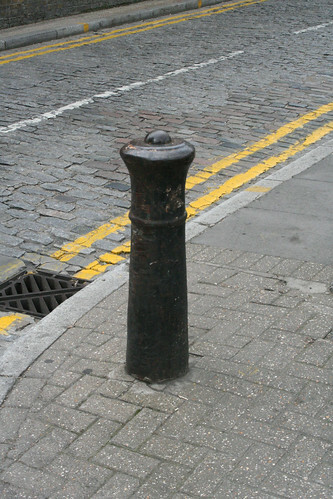 Final point – someone has started a blog that comments on bollards found around London – strangely fascinating. That’s fascinating, and I might have to take a trip down for the tour as well. The only time I ever visit Brighton is to go on the summer sewer tours, so I really should have a look at the town from above the pavements one day. http://www.mybrightonandhove.org.uk/page_id__5462.aspx I think the jurys’might be out on that one. I’ve probably walked past that Wapping bollard hundreds of times since I moved, and I’ve never really paid any attention to it before now. Will have to take a closer look this evening. Nice photo of the Wapping bollard. It looks as though this one was a real cannon, but of course the pattern has been used ever since. There are commercial firms still making bollards in iron and aluminium designed to look like old cannon with a ball on top (put bollard and cannon into a search engine). Some people think that they started with cannon captured from the enemy ships at Trafalgar, but this must be a myth, because most of the captured “prizes” sank or were wrecked on the Spanish coast during the violent storm that blew up the day after the battle. If any did survive they would have been put ashore in Gibralter. Lots of French guns were captured at the end of the Napoleonic wars. Many might well have been used as bollards, because the calibres of the French guns were slightly different from the British equivalents, therefore no use to us. Most of the guns turned into bollards would have been surplus British Army and Royal Navy smoothbore muzzle-loaders, made obsolete when the rifled breech-loaders came into service after about 1860. There are scores of them all over the historic dockyards such as Chatham, buried muzzle-up, though I have not seen any yet with real cannonballs closing the end. In Europe they seem to bury them muzzle-downwards, and use the rounded breech as mooring bollards on docksides. I was wondering if you could post the references you found that supported the “cannon” theory? I have yet to find any sources that I find convincing. “47 Two Iron Guns, 9 pounders. English c. 1700. Above on p. 70. Book published by HMSO 1976, while Blackmore was on the staff at the Tower of London.